Gentle Giant’s super cute line of Marvel Animated Mini Statues based on the artwork of Skottie Young and his popular Baby Marvel variant comic book covers continues with one of the most beloved Marvel Mutants of all time, the X-Men’s Storm! But what’s really crazy about this release is Storm is the 20th piece in this Gentle Giant collection. 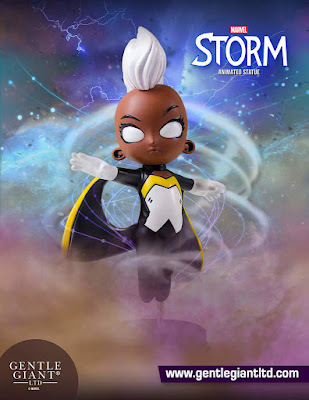 This Marvel Animated statue is based on the variant comic book cover art for Storm #1 by Young. The regal Storm is depicted using her powers to hover over her base with her signature white Mohawk and cape blowing in the breeze. The Storm Animated Marvel Mini Statue by Skottie Young stands 5.75” tall, is hand-cast, hand-painted and hand-numbered with a limited edition certificate of authenticity. This Animated X-Men statue can be pre-ordered now at Entertainment Earth for $64.99 here.